Arunachal Chief Minister Pema Khandu reviewed the projects related to drinking water, road and power projects that are of importance to daily life, in a meeting with DoNER . 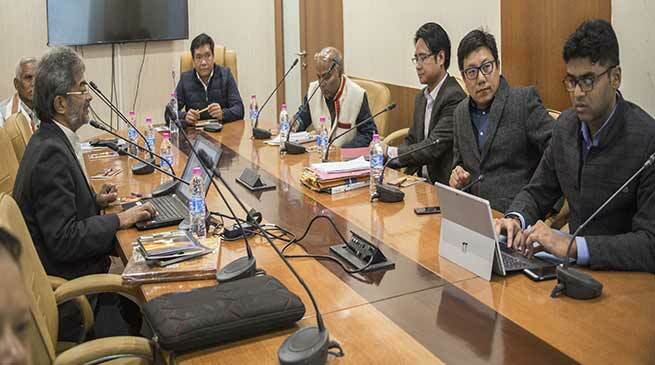 Chief Minister Pema Khandu today reviewed the projects under Non Lapsable Central Pool of Resources (NLCPR) for the state at a meeting with the Secretary of DoNER Naveen Verma here. The meeting discussed mainly on projects related to drinking water, road and power projects that are of importance to daily life. The meeting also discussed on the new Central Sector Scheme of “North East Special Infrastructure Development Scheme” (NESIDS) and how to carry it forward in the state. The scheme is 100% centrally funded to fill up the gaps in creation of infrastructure in specified sectors till March, 2020. The Chief Minister reviewed the status of various ongoing and incomplete road projects in the state and sought reasons for the delay in completion. DONER Secretary urged the state govt to focus on road that will give impetus to agro and tourism industry in the state. He also suggested the state govt that Arunachal can promote itself in tourism by giving concessions to big filmmakers.